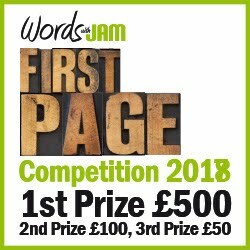 Words with JAM: First Page Competition 2018 - THE RESULTS! 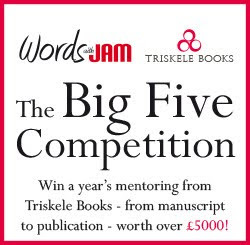 The last writing competition I judged was for ‘vignettes’, not a term I’d stumbled across before. The premise was that anything went, provided that the entire piece came in at under 15,000 words. Soon it became clear that I wasn’t being asked to judge like with like. Poetry collections were pitted against novellas. I am fairly confident that I picked the right winner, because that strange and wonderful piece called The Walmart Book of the Dead has just been made required reading at Princeton University. The language must speak to me. I should be transported to another time or place. Questions should be planted in my mind and I must be emotionally engaged and invested in finding out the answers. I must want to know more about the characters. Key themes should be introduced, either familiar themes (in which case they must be handled in an original way) or unfamiliar (in which case the quality of the writing will have to carry me through). I should understand what is at stake. I must be able to see that the content has the potential to be developed into a novel. And that’s the difficult part of not judging a whole. I don’t know for sure if the rest of the novel has been written, if the first page is part of the Work in Progress, or if the story exists only as an idea – although I can take an educated guess. If the novel is complete, the first page will have been revisited, revised and rewritten. We will be parachuted into the action at a particularly compelling part of the story. It will be apparent from the way in which the author introduces their first character (a fully-fleshed person) and their themes (an original take). Many of my early drafts of first chapters don’t feature in the final versions of my novels. But there are many ways into a story and you need to write first chapters that end up on the cutting-room floor to work through the creative process. I can say with absolutely no hesitation that my winner is Malenki Robot. I loved the premise – a very precise set of instructions (‘Bypass the beggar woman who sleeps in the gutter on Kairaly u. Watch out for the pothole.’) – and our character, who goes to the assignment but does the very opposite of everything he/she’s been told to do. It’s a confident beginning. I am expecting something dark, quirky and original, most probably although not necessarily crime. There are hints that the author isn’t writing in his or her first language (references to a ping pong racquet rather than a bat), but it could be that our narrator is a foreigner in an unfamiliar country. I simply don’t know – the point is that I really, really want to find out. Fourteen remaining entries. My second and third choices will be the result of painful and slow elimination. I cannot claim that this stage of judging is ever entirely fair. Twelve green bottles have to go. Several entrants have used the theme, ‘new beginnings’ and so they feel ‘samey’. Several start quietly with beautiful prose, but hold back on the promise of what is to come. One totally wins me over with the first paragraph but then introduces language that completely turns me off. I have no way of telling if this has been done deliberately (in which case it was one hundred percent effective and I owe you an apology). And now there are five. All completely different. Perhaps I’ll feel more decisive after lunch. I’m wracked with guilt, having whittled the shortlist down to three. But I still have one more to lose. I write my notes in the hope that this helps with the final elimination. It does. In second place is Handle With Care. A classic dilemma. You’ve fallen in love with the wrong man, but you’re trying to be a good mother, so you have to put your children first – or do you? Original use of voice – this woman isn’t going to take things lying down, so plenty of scope for conflict. I can see that Tracy Chapman’s Fast Car will be the soundtrack the film version. In third place is The Diarist – someone has just killed someone, the police are arriving and she has a diary which must be hidden, we assume because it reveals her guilt. Some wonderful imagery – the corners of the night porter’s newspaper wafting in time with his snores. Tension extremely well-handled. Congratulations to all who entered. I especially want to commend Civil War. The writing was totally authentic. I believed every word. The reason I eliminated it was because, rather than a set-up for a novel, it was a complete piece of writing in itself. ‘Head towards the Jewish district, through the park with the broken streetlamps (don’t get mugged). ‘Bypass the beggar woman who sleeps in the gutter on Király u. Watch out for the pothole. ‘If you are offered directions, do not accept. Do not tell anyone where you are going. ‘Székely u. is “dog district”. You may find yourself tailed by anything up to twenty strays. Walk quickly, but no sudden movements. Do not stroke or feed the dogs. ‘There is no marker on the bar. Look instead for a lit window and keep an ear out for music. You should hear jazz. If you don’t hear jazz, it’s a bad time, come back later. ‘Front door is always locked. Use window instead. Be sure not to break anything on your way in. ‘No eye contact with anyone until you’ve ordered. Acceptable drinks to order: beer. Do not ask for whiskey, gin or rum. ‘You will meet a man named Thovas, usually found at the bar or near the window. He will have a racket in his pocket and will most likely be drinking beer with a slice of apple. I strolled in through the window and ordered myself a whiskey. Thovas was easy to spot. He sat by himself and the bare bulb overhead fell on him like a spotlight. He had half a fruit basket floating in his beer. He sensed me immediately as I approached and his neck snapped upright. His face was wrinkled but alert. Electricity flowed from his eyeballs. I wondered if they were hooked up to the lighting in the joint. I gestured towards the racket protruding from his coat pocket. His eyes grew an extra 60 watts. The first night police showed up at the house we’d just moved in. My teapot was on the table, porcelain gleaming in a nest of newspaper and curls of used tape. I knew jack about tea. Only that you drank the stuff. But I did know I wanted that pot. A handful of hints two Christmases past was all it took for Dad to shell out its disgusting value in cash. But I couldn’t reach the top cupboard. I had to wait for Mitch to ramble home from his snack run. The police waited for him too. He got off with a fine. No conviction recorded. Oily rag stuffed in his jeans, Mitch brewed Barry a cuppa while Constable Burke scouted out zip-lock bags. I blathered at her nonstop. Guess I was never much for tension. Mitch got an order, community-based. He never shirked an appointment, ever ready to piss on cue. I lived on pins, my only prayer that he’d piss clean. But the law came by again. We had a casserole in the oven. The dish burnt and battered by decades in their honorary grandma’s kitchen, I turned down the heat and packed the kids off to their room for homework. ‘What’s Barry want Mitch for?’ my eldest asked, eight and uneasy. I told him not to worry. I smiled, a painful postscript left unspoken: not a written test, anyway. The dirty sample breached his order. He got imprisonment. ‘I don’t want to see you here again,’ the magistrate warned, suspending it. Mitch’s fervent nods swung on a hinge. And the cops were back before long. This time Dad’s old slow cooker bubbled and steamed. They’d learnt dinner was when to catch us. ‘Sorry, April,’ said Barry, smacking Mitch on the shoulder. Then he steered him out the door. Again. Barry liked Mitch—Mitch made it hard not to. The officers smiled at him like a family who treasured their beloved black sheep. Our tidy suburb’s obliging problem child. He was such a lovely guy. And he was mine. But I couldn’t take much more of this. Her boots crunched in the snow as she hurried from the Underground station, pulling her coat collar up around her neck against the chill. Her laboured breath fogged the air. It was terrible, but he’s dead now. It’s over. An empty, brightly-lit bus trundled past in stately silence; not a night to be out. The plane trees stood like sentinels at the snow-muffled kerb. The buildings’ lights created pools of gold on the white mantle. Careful not to slip; disastrous. No-one must see me. In minutes, she was climbing the steps to the flats. Bert, the night porter, snoozed at his desk, an Evening News folded across his face, its corners wafting in time with his snores. She crept up the carpeted stairs. The noise of the lift with its clanking gates and grinding mechanism would wake him. Reaching her sanctuary, she leaned against the closed door out of breath and with her heart pounding so hard it vibrated throughout her body. Her mouth was dry as a husk. She removed her coat and boots, put them to dry and made tea, her hands shaking. In the bedroom she changed her clothes and then snatched the blue leather diary from beside the bed and took it into the living room. No point in turning on the television; it was almost time for closedown. Her terror abated, replaced by relief and even serenity. Opening the diary’s shattered cover, she perused the closely written pages. Memories stirred emotions that she thrust aside. The handwriting, initially neat and controlled, had gradually deteriorated. In those last tortured months, when she poured such hatred and misery into the book, words became knotted and mangled, devouring the pages until, in the last paragraphs, they stopped in prosaic finality. She slammed it shut. Mustn’t waste time. Hide it where no-one will look. A car drew up outside. Doors slammed. Several pairs of feet crunched up the steps. The car’s light flashed blue, slicing the icy air and reflecting on her curtains. A pause, and the lift rattled to the second floor. Bert will have woken for them. Panic. She spun around, seeking a hiding place. She lifted the sofa’s front legs and, her supple wrist twisting unnaturally, thrust the book up deep amongst the springs. The seat dropped to the carpet, the fringe trembling as it settled. Excellent, but I think the third one is better than the second. Just my opinion, but it grabbed me more than the second one did. My Assignment Help best for assignment writing and always provide top-quality paper. We at Top Quality Assignment with wide ranges of subjects are covered with separate writers for each subject. Students with assignment problem can visit our site and can get a comprehensive solution. We are also a service provider that deals with the assignment writers Australia help sector. So, the students struggling to write their college and school assignments can opt for our online assignment help and can get a quality assignment written in Australia.